Description: Shell thick and solid, aperture about 70% of total shell length. Spire elevated, straight in outline, whorls flat. Shell with fine spiral grooves over whole surface. Aperture fairly broad, with 2 folds below middle of inner lip, and smaller fold at top. Outer lip with strong denticle internally, extending as thickened ridge to bottom. Thick varix outside outer lip. Umbilicus closed with spiral ridge above. Colour brown or black, sometimes with white spiral bands. Size: Up to 25 mm in length. Distribution: Tropical Indo-West Pacific, including northern Australia. In eastern Australia, as far south as Sydney. 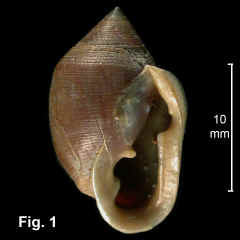 Habitat: Found on mud and wood among mangroves in the upper littoral zone. Common in the tropics, uncommon in NSW. Fig. 1: Brunswick Heads, NSW (C.309720).